Limerick go forward to face Clare in the decider. Colin O'Riordan has struck two goals for Tipperary. LIMERICK’S U21 SIDE gave their county’s hurling fortunes a major boost with a rousing win over Tipperary in tonight’s Bord Gáis Energy Munster U21 semi-final at the Gaelic Grounds. Despite being reduced to 14 men for the last quarter when centre-back Barry O’Connell received a second yellow card and seeing Tipperary draw level, Limerick ground out a victory that sets up a final against Clare on 30 July in Ennis. Tipperary were also reduced to 14 men in the 61st minute when Michael Breen was shown a second yellow card. Ultimately the Premier were left to rue a slow start as they went 12 points down by the 24th minute. Limerick goalkeeper David McCarthy received the man-of-the-match award after a couple of stunning saves with his first-half block to deny John McGrath from netting and then a crucial intervention late on to stop Ronan Maher from raising a Tipperary green flag. Limerick had got off to an explosive start with Cian Lynch whipping a ground shot to the net with only 15 seconds on the clock after midfielder Pat Ryan burst through. Both sides were guilty of poor early shooting thereafter but Limerick found their stride with wing-forward David Dempsey striking some quality points to send them 1-7 to 0-2 clear by the 21st minute. Then Limerick surged further ahead when Robbie Hanley crashed home their second goal in the 23rd minute after Dempsey turned provider. Tipperary looked to be in serious trouble but senior football star Colin O’Riordan hauled them off the ropes as he banged home two goals in the closing five minutes of the first-half. With Stephen Cahill and McGrath also finding their range, and allied to a towering defensive display by senior Michael Breen, Tipperary found themselves still in touch at the break as they trailed 2-9 to 2-4. Tipperary quickly went about eating into that Limerick advantage early in the second-half. Substitutes Josh Keane and Jack Shelley chipped in with points along with efforts from Cahill and Breen. Limerick’s only response was a fourth point from Dempsey and they were thwarted in their efforts to hit the net in the 37th minute when Tipperary’s Paul Maher got down well to scoop away a low shot from Colin Ryan. Then Limerick’s woes were compounded when O’Connell was dismissed and the momentum lay with Tipperary. However backed by a vocal home support, Limerick dug in. They got a major break in striking home a third goal in the 45th minute as Morrissey bundled home a rebound after Dempsey’s initial strike was saved. 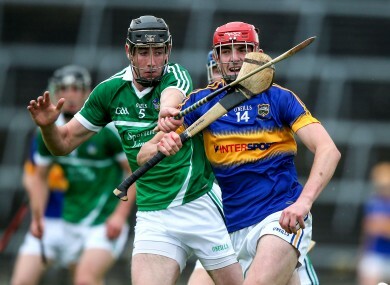 Tipperary responded with points from McGrath and Tomás Hamill before Morrissey sent Limerick 3-11 to 2-11 clear. Then Tipperary corner-forward Tadhg Gallagher raced in from the wing to smash home their third goal and bring the Premier level. Limerick’s prospects looked shaky but despite the handicap of operating with a man less, they finished the stronger. McCarthy’s brilliant save was a significant moment while substitute Colin Ryan was outstanding as he hit 0-4 in the finale. Jack Kelliher also raised a white flag after being sprung from the bench. Tipperary poured forward but Limerick’s defence held firm with Diarmaid Byrnes and Gearoid Hegarty making a couple of big plays while Pat Ryan’s midfield play was impressive throughout. Scorers for Limerick: Tom Morrissey, Cian Lynch 1-1 each, David Dempsey, Colin Ryan (0-3f) 0-4 each, Robbie Hanley 1-0, Darragh O’Donovan, Ronan Lynch (0-1f, 0-1 ’65) 0-2 each, Pat Ryan, Jack Kelliher 0-1 each. Scorers for Tipperary: Colin O’Riordan 2-0, John McGrath 0-6 (0-2f, 0-2’65), Tadhg Gallagher 1-0, Stephen Cahill 0-2, Michael Breen (0-1f), Barry Heffernan, Tomás Hamill, Bill Maher, Jack Shelley, Josh Keane (0-1f) 0-1 each. Email “14-man Limerick see off Tipperary to win six-goal Munster U21 hurling thriller”. Feedback on “14-man Limerick see off Tipperary to win six-goal Munster U21 hurling thriller”.